Private Salerno & Vietri sul Mare Tour Includes: services of a professional tour guide, door-to-door transportation, tolls, taxes, fuel and parking. Your private tour begins with a short drive through Salerno, the main town en route to the Amalfi Coast. An important cultural center in Campania, Salermo is best known for its centro storico, a lively district where medieval churches play neighbor to trattorias and wine bars. 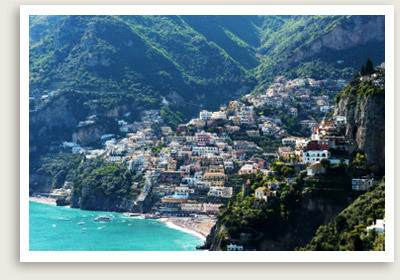 Next you will tour Vietri sul Mare, one of the 13 pearls of the Amalfi Coast. Sheltered at the foot of Mt. San Liberatore, Vietri sul Mare is world-renowned for its blue and yellow ceramics, a traditional local handicraft dating back to the 15th century. Legend has it that the Greek hero Jason, during his wanderings in search of the Golden Fleece, founded the old “Marcina” on these shores. The town has a lively history, from its Etruscan origins and important role as a commercial port, to Roman occupation and jurisdiction by Benedictine Abbey of Cava. There are several major sites of interest you may visit here, depending on time and interest. The Church of St. John the Baptist, built in the 17th century in the Neapolitan Renaissance style, features a classic bell tower and a beautiful dome covered with ceramic Majolica tiles. There are many treasures to behold inside, including a fine marble altar, a gold, coffered ceiling, an alabaster statue of St. John, a 19th century altarpiece and a crucifix painted on 11th century wood. You may also choose to visit some other area churches, to include the 17th century Confraternity of the Annunciation and the Rosary, whose marvelous façade is decorated with painted pottery; the 17th century Church of the Madonna delle Grazie; or the Church of Santa Margherita. Other historic sights include the World War II-era Palazzo Solimene, featuring an exhibition of contemporary ceramics; the former Palace Taiani with the picturesque dovecote tower, also used as an anti-pirate watchtower; as well as other historic towers. You may also want to visit Villa Guariglia in the village of Rialto, surrounded by a beautiful park full of Mediterranean flora. Today it houses the Museum of the Ceramics of Vietri. After learning about the local tradition of ceramics, you may pick up some souvenir ceramics from the craftwork shops and ateliers dotted throughout the town.